Millions of bicyclists are injured every year from automobile accidents. In an effort to solve this problem, we looked to wearable technology as a potential solution. 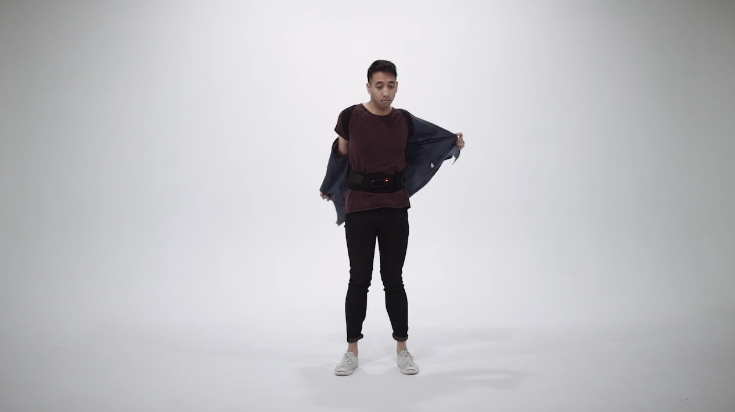 Spondy is shaped as a lightweight brace and is meant to be worn underneath clothing. Wear it under an overshirt or jacket to have discreet protection. This fabric is a special technological material that is normally very flexible but hardens into a rigid form when hit with an electric current. This hardened shell backing protects against impact and other lower back injuries. Spondy's crash sensor is programmed with an algorithm to detect movements that indicate bicycle crashes. When a sudden crash occurs, the sensor instantly activates the electro-laminate back to harden.